Rippin’ Red Wing Sauces from Maryland based Rizzotti Foods LLC from Abingdon, MD are two wing sauces that meet or exceed what we like in a bottled wing sauce. Their “original” and “hot” versions are available on RippinRed.com. As you can see below, the only difference in the ingredients is the habanero powder added to the “hot” version. Otherwise, they have “all natural” ingredients with nothing artificial. A big plus in our ratings. Having said that, we didn’t detect a great deal of difference of heat in the “hot” versus the “original” versions. We would like to taste a bigger hit and flavor change between the two. 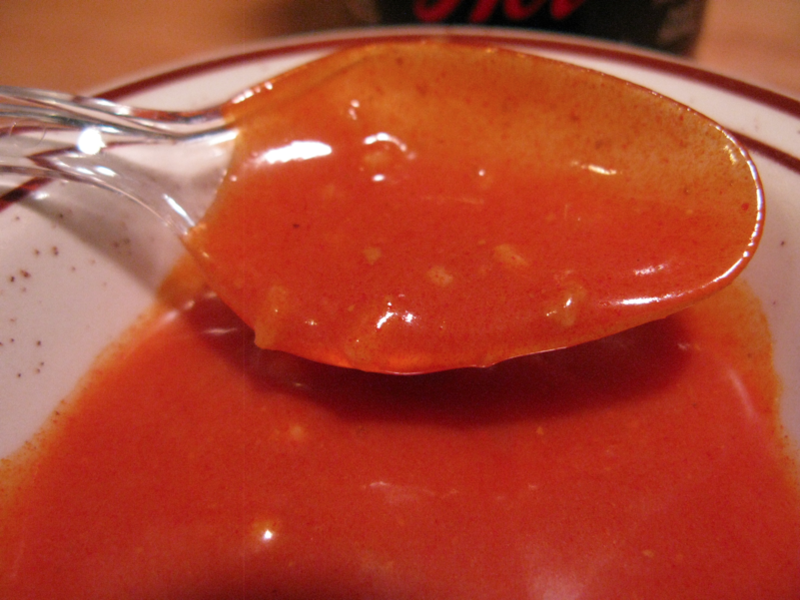 These are typical cayenne based sauces with a heavy vinegar slant… fairly true to the original “buffalo style” wing sauce. What we liked were the bits of garlic floating in the sauce, as well as the “unsalted butter” and “parmesan cheese” ingredients that brings these sauces to a higher level of quality, as compared to other bottled wing sauces that use a fake butter flavor or other chemical additives to pump up the butter flavor. Marilyn: As always, we still prefer to combine our own ingredients to achieve the flavor profile we like (hot sauce, garlic, butter, cilantro, etc. i.e. our famous Sriracha Wings), but these bottled wing sauces gave us more true “Buffalo-Style” wings than we’ve ever gotten in any other jarred wing sauce…. they even beat out Hooters in my opinion. 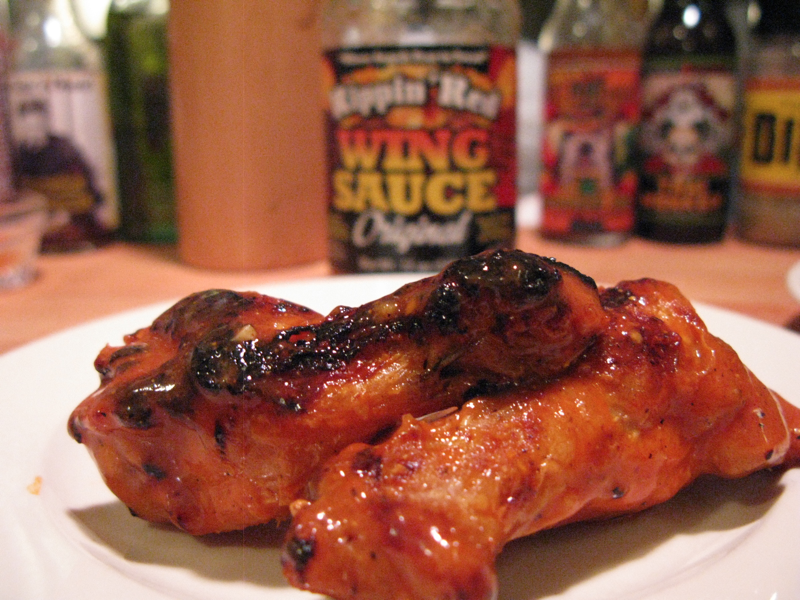 So kudos to Rippin’ Red for making a great “out of the jar” wing sauce. The garlic won me over, and they both make the grade. 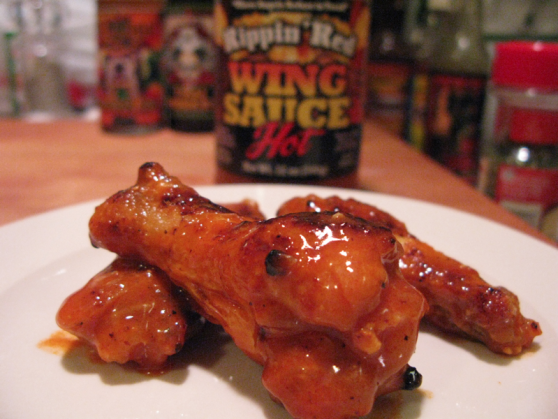 Brian: These are quality sauces that any wing lover would be happy to serve to their friends at a football game. But. And it’s a BIG but, compared to what you can make from our recipes or other sites’ recipes, these are sauces that make things quick and easy. You cook the wings, you douse or toss them into the sauces, and voila! … you have hot, spicy, garlicky wings. Our final rating: The “Original” version – 4 out of 5 peppers – The “Hot” Version – 3 out of 5 peppers. They are both so good, and for a bottled sauce, you cannot go wrong. And be sure to visit RippinRed.com and check out their Reviews Page for other bloggers’ take on these sauces. I’m with you and Marilyn, Sriracha wings rule. But I think these commercial sauces are good for people who don’t want to bother with making their own. 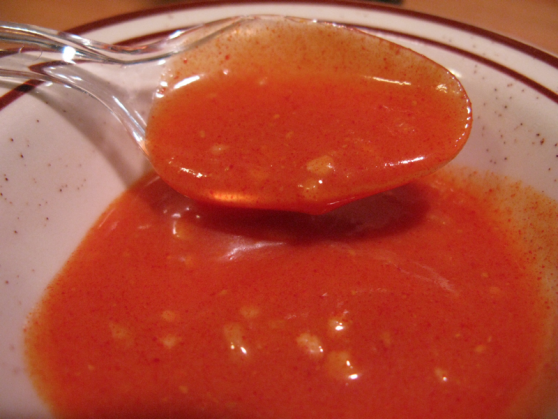 Yes, but check out the next comment from Rippin Red’s John… his Sriracha sauce is coming soon! Yay. Thanks for the Great review!!! Just an FYI I have a version of Srircha wing sauce I am going to bottle in the near future. You’re welcome. That’s some really good news about your upcoming Sriracha wing sauce. Bring it on! Great review, guys. I did a review of this sauce recently and had the same conclusions. Good stuff. A nice and tangy flavor, good heat level on the original sauce – tasty plain and simple. I look forward to trying the Sriracha. Thanks, Mike. I look forward to your experience with the Sriracha. I know a few Chileheads that just don’t like it. Too bad for them, more for us!